Who said you can’t get clean and clear skin naturally? Decades before women used to take care of skin using natural ingredients from kitchen. However it isn’t always possible to use natural ingredients due to tight day schedule. So grab the product and use it. It is quite easy. Here we have explained how to get clean and clear skin naturally and also steps on how to take care of your skin. Know your skin type and based on that pick the right method for you. Choose products made for your skin type. Drink at least 8 glasses of water. We recommend you to drink 2 liters to eliminate all the toxins through skin and keep it hydrated. Choose organic cleanser over chemically loaded cleanser. If you want you can also try oli cleansing method. Eat healthy. Take more vegetables and fruits and avoid junk foods. Prevent any nutritional deficiency. Restrict yourself from smoking tobacco products and drinking alcohol. Wear less makeup and keep it minimal. Choose only natural and mineral makeup. Avoid going out between 10 am to 2 pm. If you have to go, then apply sunscreen with at least SPF 15. Reapply every two hours. Protect your skin from harmful UV rays as much as possible. Exercise regularly. Sweating clears the skin by removing dirt. Twice a week deep clean and exfoliate your skin followed by a good facial mask. Take herbal teas at least thrice a day. This provides antioxidants and provides natural glow to your skin. Never touch or pick your pimples. Do not apply too many products which make your skin lose its natural pH balance. Don’t use soap on your face. It is made for your body. Do not over scrub your face. It only harms but don’t do any good. Use cleansers containing alkaline and avoid creams with vitamin A and D since they can’t be absorbed by the skin. Apply lemon juice all over face and neck and leave for 10 min followed by rinsing it well. Rub a cucumber slice to soften and moisturize your skin. Do this regularly. Mix lemon juice with raw honey and apply it all over face and neck. Leave it for 15 – 20 min and then rinse well. Mix lemon juice with sugar and apply it followed by scrubbing in circular motion. Leave it for 10 min and then rinse. Make paste of it my mixing with pineapple juice and apply it. Leave it till it dries and then rinse. Mix it with gram flour and milk. Apply it and leave it till dries and then rinse it well. Apply it all over face and neck and leave it for 15 – 20 min and then rinse. Mix it with milk and apply it all over face and neck. Leave it for 20 min and then rinse. Take out the gel from the leaf and apply it using a cotton balls. Leave it for 30 min and then rinse. Mix it with water or lemon juice to make paste. Apply it over clean face to exfoliate. Massage for a minute and rinse well. Mix it with honey and apply all over face and neck. Massage it gently for a minute and then rinse well. Rub a slice of cucumber all over face and leave it overnight. Rinse it the next morning and repeat it every day. Mix its juice with lemon juice and apply it to the face. Let it dry and then rinse it well. 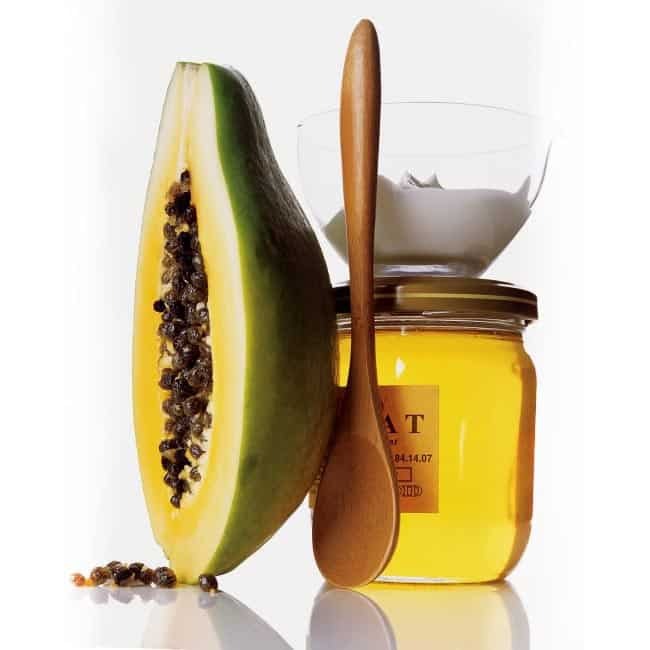 Mix mashed papaya with sandalwood powder and honey followed by applying it to the face. Leave it for 30 min and then rinse. Mix walnut powder with yogurt and make paste. Apply this all over face and neck and massage for a minute to exfoliate. Rinse it well and do this at least once a week. Soak walnuts overnight and make paste with some rose water. Apply this all over face and leave it for an hour and then rinse. Eat 2 – 3 walnuts with a glass of milk every morning. Apply lukewarm oil all over face and neck and massage it well for 10 min. Rinse it well with some water and repeat it every day. Mix mint powder with yogurt and fuller’s earth and let it soak for half an hour. Apply this all over face and neck, and leave it till dries completely followed by rinsing.